Nigel Mansell said Ayrton Senna would be remembered as a "true thoroughbred racer" as he led tributes on the 20th anniversary of the Brazilian's death. Senna, winner of three Formula 1 titles, died aged 34 on 1 May, 1994, when his Williams car crashed at the San Marino Grand Prix at Imola. Former world champion Mansell told BBC Sport: "Ayrton was our toughest rival. "He would leave no stone unturned to get the utmost out of his car and his team." In an interview broadcast as part of Radio 5 live programme The Day Senna Died, Mansell added: "In the 1980s, I was blessed to drive against so many great drivers but Ayrton certainly stood out most among them." The 1994 San Marino Grand Prix was a dark weekend for Formula 1. On the Saturday, Austrian Roland Ratzenberger was killed when he crashed his Simtek in qualifying. The following day, Senna suffered fatal head injuries when he crashed at the 190mph Tamburello corner. At the time, veteran BBC F1 commentator Murray Walker said: "This is the blackest day for grand prix racing that I can remember in the many, many years I have been covering the sport." During a 10-year Formula 1 career, Senna developed a reputation as a spectacular racer with a pure talent - though critics also pointed to a perceived sense of entitlement that at times placed his own life and those of his rivals at risk. He won 41 grands prix, third on the all-time list behind Michael Schumacher and Alain Prost, and achieved 65 pole positions, a feat bettered only by Schumacher, whose own career was twice as long. "I interviewed Senna in 1991, when the biggest question at the time was whether he had intentionally taken Alain Prost out of the 1990 Japanese Grand Prix, which secured him the World Championship that year. "I asked him the question and he refuted it, but I said it certainly looked like that to me. Senna did not speak to me for at least a year after that, but when I was in Australia for the grand prix he called me in my hotel. "He told me he was going to announce to the media that he took out Prost intentionally and that God would not let him tell a lie and keep it that way. "I really respected him for doing that and, for all his great drives, that one phone call was my greatest memory." Williams team principal Sir Frank Williams said: "Ayrton knew what he wanted and he knew of the various people inside the company who could deliver, and he went after those guys and got them onside. "He was certainly on his way to becoming a president of Brazil. He had politics in mind, and if he had done so he would probably have walked it." Damon Hill, Senna's team-mate in 1994, said: "The Japanese and the Brazilians saw him as a god. His passion was undeniable and I sincerely believe he wanted to make the world a better place." 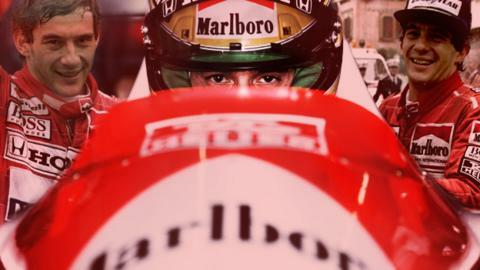 McLaren chief executive Ron Dennis, who was Senna's team principal when the Brazilian won his world titles in 1988, 1990 and 1991, told BBC Radio 5 live: "He lived for the sport. When people do that, they sacrifice everything to be the best at it. "He understood what was needed. He had the fitness, the right mental approach, the right skills and the right level of passion." Bruno Senna, Ayrton's nephew, said: "Ayrton touched so many people's lives in so many different ways - racing fans with his genius in the race car, and non-racing fans with his character and charisma. "It is sad to not have him here but we look on it as a celebration of what he has left for people." Mercedes driver Lewis Hamilton said: "Ayrton Senna was an incredible legend, who will be remembered and admired forever. "He had the rare quality of greatness. A lot of the way I drive today is inspired by the way I saw him drive." Mansell (left) said he and Senna were initially "great enemies" who "developed a healthy respect"
F1 boss Bernie Ecclestone added: "My very vivid memories are of his strong opinion - and most of the time it was right." Senna's thrilling rivalry with French four-time champion Prost and Britain's Mansell, the 1992 world champion, is the stuff of legend. "In the beginning, we were great enemies," said Mansell. "He wanted to win at all cost with everybody, so we knocked heads quite a lot." One example came at the 1987 Belgian Grand Prix when Mansell went for a pass around the outside in his Williams, but Senna - then at Lotus - squeezed him and they crashed. "Ayrton could intimidate pretty much every driver on the grid but he realised then I would not cave in and he would have to readdress his psyche towards me," said the Briton. "We went on to have many incredible races, where we didn't knock each other off. It was just good, hard, clean racing. "And as the years ticked on, we developed a healthy respect and understanding for each other and became friends."